EcoFriendly Sask: It's Our Birthday! Let's Celebrate! Five years ago, Andrew McKinlay and his wife went on a long hike. Andrew wanted to do something to help the environment but wasn’t quite sure how he could best use his skills and talents. As he walked, he came up with an idea. As an avid reader, writer, and photographer, as well as a software programmer, he felt that he could help by compiling and sharing information from all the different groups and individuals who were involved in local environmental issues. He enlisted his sister, Penny McKinlay, a writer and editor, to help. By sharing information about everything from prairie birds and plants to renewable energy and passive housing, we hoped that we could inform and unite people who shared a common appreciation for our natural environment while still maintaining a very local focus. A year later, EcoFriendly Sask went one step further and started offering small EcoFriendly Action Grants to support local projects that will improve the environment. 650 likes on Facebook – we’d love to hit 1,000 – can you help? 400 articles posted on our website, including EcoSask News, which has been published every single week with very few exceptions. We’ve also expanded our website to include lists of books about nature in Saskatchewan, environmental organizations, and summer and winter outdoor explorations. Our Calendar lists events around the province – everything from films and book launches to field trips and volunteer opportunities. But the number that means the most to us is also the smallest. We’ve provided 103 EcoFriendly Action Grants to groups and individuals from La Ronge and Buffalo Narrows to Estevan and Moose Jaw. That money has been used to plant trees, support school trips and alternate forms of transportation, promote solar-powered carsharing, and so much more. Andrew went on another long hike this spring and came back with another big idea. Penny is already hard at work! Curious? 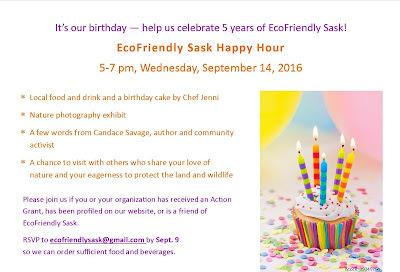 If you or your organization has received an Action Grant, been profiled on our website, or is a friend of EcoFriendly Sask, please join us in Saskatoon on September 14 for the EcoFriendly Sask Happy Hour as we celebrate past accomplishments and look ahead to the future. 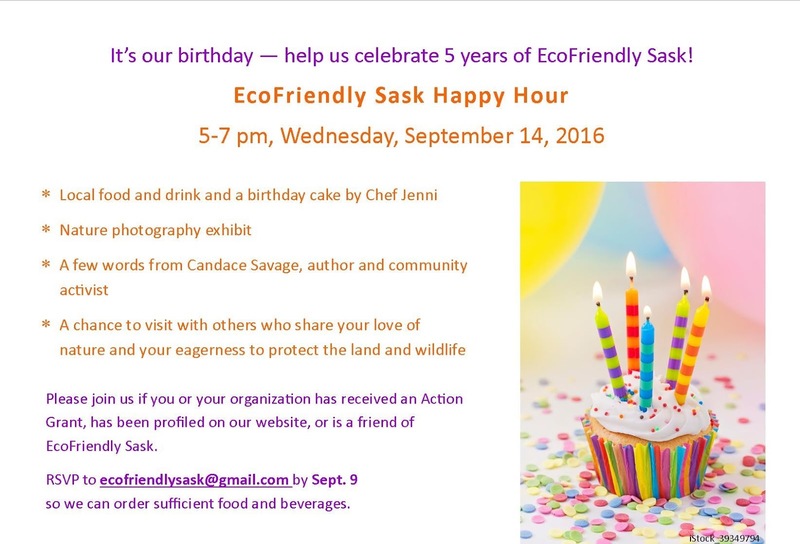 RSVP to ecofriendlysask@gmail.com by Sept. 9 so we can order sufficient food and beverages.